Tana lives in a world where walled cities called Coldtowns exist. In them, quarantined monsters and humans mingle in a decadently bloody mix of predator and prey. The only problem is, once you pass through Coldtown’s gates, you can never leave. One morning, after a perfectly ordinary party, Tana wakes up surrounded by corpses. The only other survivors of this massacre are her exasperatingly endearing ex-boyfriend, infected and on the edge, and a mysterious boy burdened with a terrible secret. Of course, you already know I love Holly Black, as a teen and as an adult, so do I really have to explain why I picked up this book? Sure, why not! I’ve been craving a good vampire read lately (yes, I know they’re not really ‘in’ right now) and so when I had a break in my review schedule, I was excited to read Black’s take on the supernatural creatures. I was also excited to be able to get this book as free audiobook loan through Libby and my local library! The book starts with Tana waking up in a bathtub the morning after a pretty standard teenage party, but when she gets up to leave, she finds everyone else in the house has been slaughtered by vampires, which by the way are real and typically quarantined in massive cities. Within the first couple of pages, I knew I would not be able to put this book down, and the story just got more interesting and complex from there. The plot is incredibly engaging and unique. There were twists I did not expect and by the end of the book, I was able to put the book down with a sigh and a craving to read it all over again. The world Black created gives a unique twist to the usual young adult vampire story. Vampries are real, everyone knows it, and some people even obsess over them the way people would obsess over celebrities. I appreciated being able to read a story with one of my favorite supernatural creatures without all the tropes normally involved, like the shocking revealation that the boy the main character has a crush on is a vampire. This world, and the backstory behind it, was unique and refreshing for the genre. By the end of it, though, I did have some questions about the elements of the world that went unanswered. Tana, as a character, wasn’t always likable but she was always interesting. She didn’t make the best decisions, or even ones that I could relate to, but compared to all the vampires and vampire-crazed characters around her, I definitely understood Tana the most and felt invested in her. Most of the other characters were designed to be foreign and unlikable, with the except of Tana’s love interest. These two characters are amazing chemistry that made me crave their next scene together. 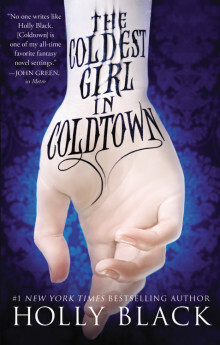 The Coldest Girl in Coldtown is a fun and unique take on popular young adult vampire novels. The book is certainly long, as many of Holly Black’s books are, but it was a quick read for me as the story hooked me right away. And, like many of Black’s books, there are many dark and gruesome elements, but overall, I felt it was lighter than her recent release, The Cruel Prince. The Coldest Girl in Coldtown was release in 2013, so you should be able to find it at most booksellers, but consider borrowing the e-book or an audiobook through Libby.